Sunday, February 19, marked the fourth annual RFD-TV’s “The American” rodeo presented by Polaris RANGER. 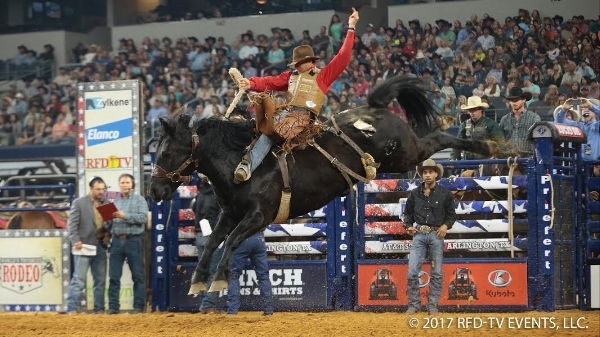 The toughest and most skilled rodeo athletes in the world competed in the richest single-day rodeo event at AT&T Stadium in Arlington, Texas, with two million dollars up for grabs. Professional veterans from the PRCA, ERA, WPRA, and PBR competed with passionate, and talented underdogs for the coveted gold buckle. The winner of each event earned $100,000. However, the “underdogs” who won in their respective events shared in an extra $1 million bonus. Three athletes, barrel racer Hailey Kinsel, Cotulla, Texas; saddle bronc rider Cody DeMoss, Heflin, Louisiana; and bull rider Sage Kimzey, Strong City, Oklahoma, who received an exemption, achieved this dream, taking home $433,333 each. Photo courtesy of RFD-TV Events, LLC. Visit www.americanrodeo.com for more information. Some may say that these contestants were lucky, but I would disagree. It was grit and determination. Passion, excellence and hard work. It was their mere desire to see their dream come true that catapulted them to #1. Just like baseball, hamburgers – and rodeo – the pursuit of a dream is about as American as it comes. The phrase “American Dream” was not coined out of coincidence. We are the progeny of pioneers who were optimistic about what life could be. The threadwork that makes up the Stars and Stripes represents those who were tenacious and worked in pursuit of achievement to see their dreams come to fruition. Simply put—the passionate pursuit of a dream runs through the veins of every American. Three contestants, Two rounds, One Dream. The spirit of the rodeo cowboy exhibited in the arena during The American is something we all share – It’s a passion…. A way of life… and when we throw our leg over the saddle and mount our horse, we harbor the cowboy-spirit in our hearts. Do you see yourself digging in around the barrels and racing towards the finish line? Or sticking your landing off a bronc after an 8 second ride? Do you envision yourself within the winner’s circle? Throwing a perfect loop and catching two heels? Or is your dream simply putting on your boots and tightening a cinch for a ride in the afternoon sun? Within each of us lies a passion… a dream… a desire. And we have two options. We can either sit idly and watch others pursue their dream and achieve their goals, or we can engage and take steps towards our own personal achievement. Our goal is to help you build your dream. We work alongside those who are passionately in pursuit of seeing their dreams become a reality. Each step of the way, we work to ensure that the determination and hard work that you’ve put forth for personal achievement is mirrored by the work we do, and the barns we build. American Dream – American Made. Champions know that every detail is important to reach their potential. With an AmeriStall horse barn or metal building, you have the opportunity to customize your barn to meet the needs of your horse, compliment your discipline, and fit your style. We take care of every detail so that you can focus on what’s more important. Visit www.ameristall.com or www.buildsouthwest.com for more information. Older PostHow Much Land Do You Need for Horses?